Enter Virtual SWAG. Distribution and price are very attractive because you can make a downloadable once and have it available over the web. Virtual swag is usually in the form of posters, cheat sheets, summary sheets, PDF’s or other downloadable documents. In order for geeks to be interested in any virtual swag, it must be useful and/or meaningful and make a personal statement that resonates with them. Open Source logos or mascots communicate a lot geek-to-geek. For a lot of us, Tux the penguin is sort of the uber-open source spirit guide. He symbolizes geeks’ hatred of “suits” telling them what to do and the indomitable spirit of the open source movement. Besides, Tux is cute and fluffy in his own right, even if you are unaware of who he is. Adding Tux to any virtual swag you might create improves its attractiveness. Being a 3 dimensional object would be even better. To prove my point I am giving away a downloadable PDF. 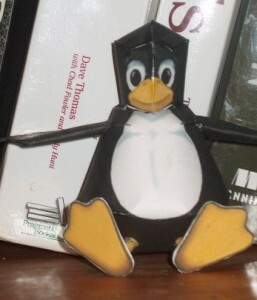 It is a single sheet that you can print on light card stock, cut, fold and assemble into a 3-d model Tux that makes a great decoration for your workspace, or a unique gift for a friend, a gift decoration or a party favor. I can do this because no one can lay claim to the digital rights for Tux. Just like the software he stands for, Tux himself is open source. This PDF is derivative from a JPG file originating from Spain, but the originating domain is no longer active. Either that or I can’t read it. I scaled up the image a bit and repackaged it as a PDF. Of course I slapped my URL on his belly so maybe you’ll remember where you got it. (If you really really hate that, there are measures you can take.) I am counting on the fact that in general, geeks actually like to build things more than most people do. I test marketed this idea (well, OK I ran it by a couple of geek friends.) They thought it would make a good blog post. Note: I found it easier to attach the wings before closing the main body in the back as the tab order would imply. The wings insert into the diamond shaped apertures left after you attach the neck tabs. On the leading edge of the wing, do not crease it, but rather roll it around a shish kebab skewer or something to give your Tux aerodynamic verisimilitude. Take your time and enjoy building your Tux and taking him along with you on some adventures. Please take photos of him in interesting places and comment with the URL’s and when I get a bunch I’ll assemble a Tux Gallery. Virtual Geek Swag 3-D tux is a great gift for window users.Even for non window users too.I have download the pdf file and printed.Soon it will be in beside of my pc screen. Virtual swag! I love it! Delivery and transport costs are a very real issue, and the ideas imparted here serves to illustrate the alternatives very nicely. I like the pdf file with the cutout idea! We need a club penguin for adults for business! Download and build my maqueta! by all means!